Growing up in a family that watched its budget, our big clothes shopping adventures took place at places like the Sears and Montgomery Ward outlets on the historic square in Independence, Mo., and the full-priced JC Penney. The few times we actually shopped in one of the more “fancy” stores was when my dad, a principal at Luff Elementary School, was given a gift certificate by one of the affluent families in his school. I remember one such time: the certificate was for Woolf Brothers, a fine men’s tailored shop that had several locations in Kansas City area, including the Blue Ridge Mall near our home and the toney Country Club Plaza. 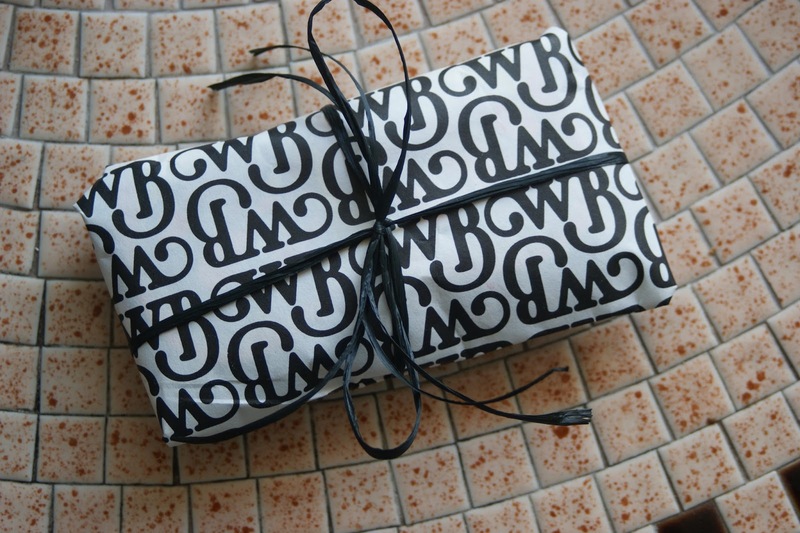 I don’t remember the exact amount of the certificate, but I do know that it was just enough to buy a beautiful silk tie and left the store in a prestigious Woolf Brothers bag. When people ask what it was like growing up in Kansas City, they usually imagine that I’m going talk about cattle and countryside. But no, Kansas City was, and still is, quite a cosmopolitan place to live. I had a diverse group of friends, the arts scene was at its peak, and the shopping was out of this world. Kansas City had a Macy’s, which was part of a Mid-West division carrying high-end goods, a Gucci shop, before it became a huge chain, Harzfeld, which sold fine women’s and children’s apparel and Hall’s, a most magnificent department store owned by Hallmark. Of these, the only one left is Hall’s, and as for Macy’s, it is a whole different kind of mass retail experience than it was in the 1980s. Sadly, Woolf Brothers closed its stores in the 1990s after 126 years in business. Flash forward a couple of decades: As I was vintage shopping in the West Bottoms at the beginning of July, my eye was drawn to this black and white paper in the corner of a shop. I immediately recognized the swingy tails on the "W" and the "B" as being from Woolf Brothers. 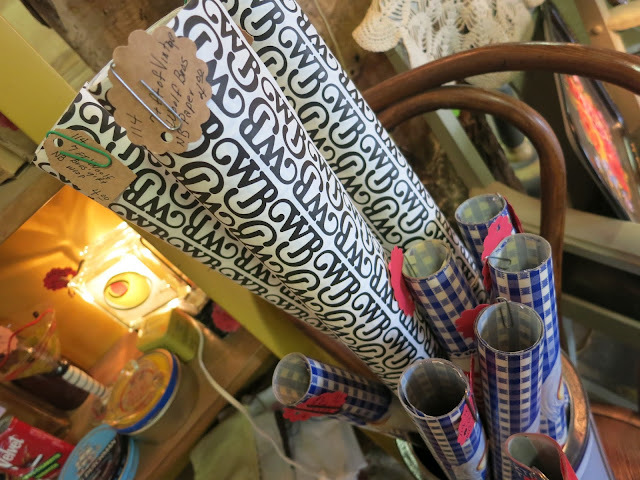 Of course I purchased a roll and used it to wrap a gift of thrift for a dear friend who has always wanted to visit Kansas City. So in a way, I sent a little bit of Kansas City to her. Photograph by Jim Franco for "The Find"
Here is another colorful relic from the pages of "The Find" that is being sold in the Living Estate of Michael Quinn in my Etsy shop. 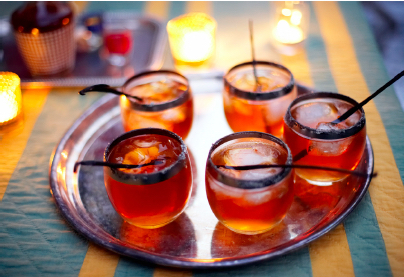 As part of an indoor tailgate party imagining a competition between the Sweets and the Savories, these glass pretties got the evening off to a rousing start. "There is something very collegiate about this set," Michael says. 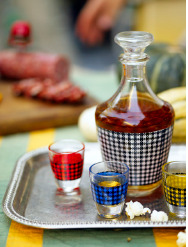 In "The Find, " it was shown on an outside quilt-covered table next to a bowl brimming with popcorn, encouraging a casual nip in the great outdoors. 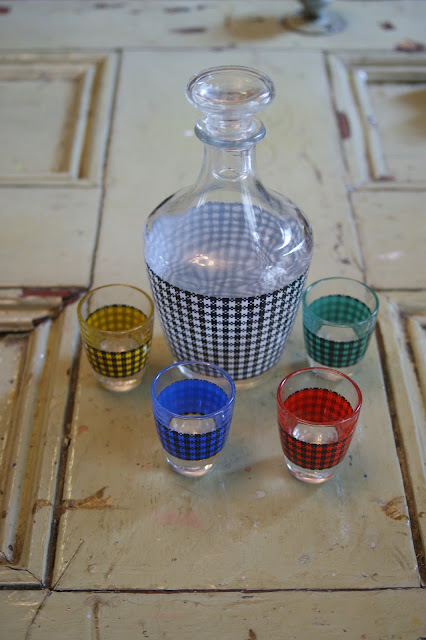 Add some class to your next “pre-game” rounds of cocktails!" With football season only weeks away, you still have time to procure these for your next sports celebration. Just pay a visit to The Living Estate of Master Michael Quinn in my Etsy shop, and let the festivities begin! When I look at this image, I am reminded of the fanciful, handcrafted indoor tailgate party that Michael Quinn and his friends threw and that was celebrated in the pages of my book "The Find: The Housing Works Book of Decorating..." (Clarkson Potter, 2009). This is a fine example of how incongruous objects, when unified masterfully, can become a focal point of a tablescape. Here, Michael used as the bar backdrop an owl shape that he kept from a Henri Bendel window display. The wouldn't be complete without the plastic biology head he purchased at a sidewalk sale in Manhattan's East village. Embedded in its left lobe is a recipe for the signature cocktail of the evening: a Dark and Stormy. The glasses at the right of this gorgeous display appear several times in "The Find" and are part of "The Living Estate of Master Michael Quinn," which is being sold in my Etsy Shop as they appear in the photograph below. 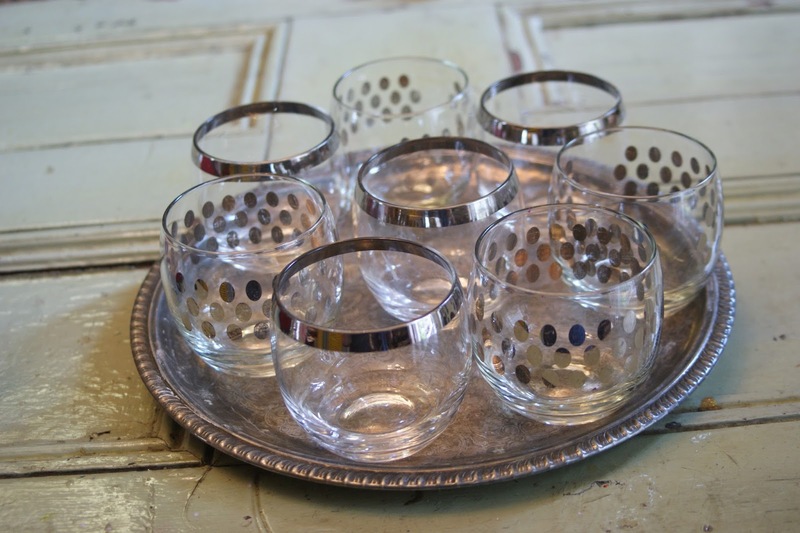 "Some wear on the etchings, these glasses have been lifted in many a toast," Michael says. 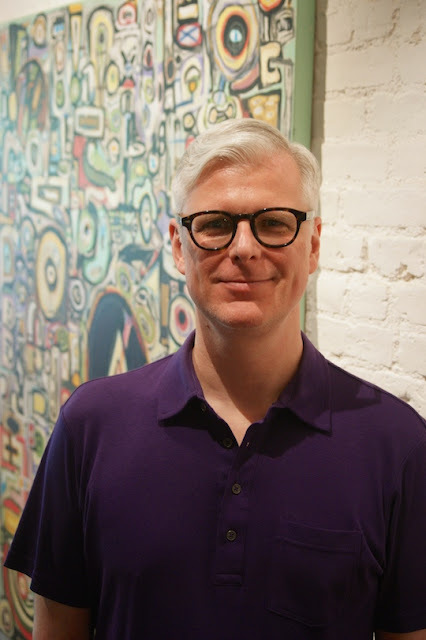 "Originally from a vintage store in Pittsburgh, I later learned the glasses had belonged to the marketing director at the Warhol Museum. How did I make this discovery? A friend of a friend. I stayed with him one weekend. Boy, was he surprised to see what treasures I came back with that day!" Own these relics from "The Find" and more by clicking here to visit "The Living Estate of Master Michael Quinn" on Etsy. 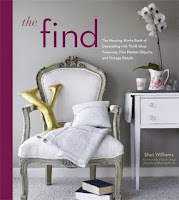 It’s hard to believe that it was eight years ago when I started creating "The Find: The Housing Works Book of Decorating...," which was released in 2009. While it was not a financial success for me, it was a huge payoff in the number of truly amazingly creative people who helped me with my labor of love and the friendships I made that endure to this day. One of the most talented characters I encountered during my pursuit of "The Find" and who remains among my closest friends is Michael Quinn. My editor at Clarkson Potter wanted me to meet a creative pal of hers. She wasn’t quite sure exactly why, but she thought there might be some synergies that I might be able to tap into and passed me Michael’s number, so I gave him a call. When I told him what I was working on, he was eager to set a time to meet in person. Convenient for both of us, Whole Foods on Houston Street was to be our meeting spot. Neither of us had any inkling of what the other looked like, but we decided we would just know. On the day of our get-together, I installed myself and my computer at an upstairs table and sipped a glass of iced tea while waiting for the person I was certain to recognize. Lots of handsome young men walked by on that summer afternoon, but it wasn’t until one wearing a headband whisked by that my attention was piqued. THAT must be Michael, I thought. He certainly didn't see me, so I called him on the mobile: “Are you the guy who just walked past my table wearing a headband?” It was, and the rest is history. 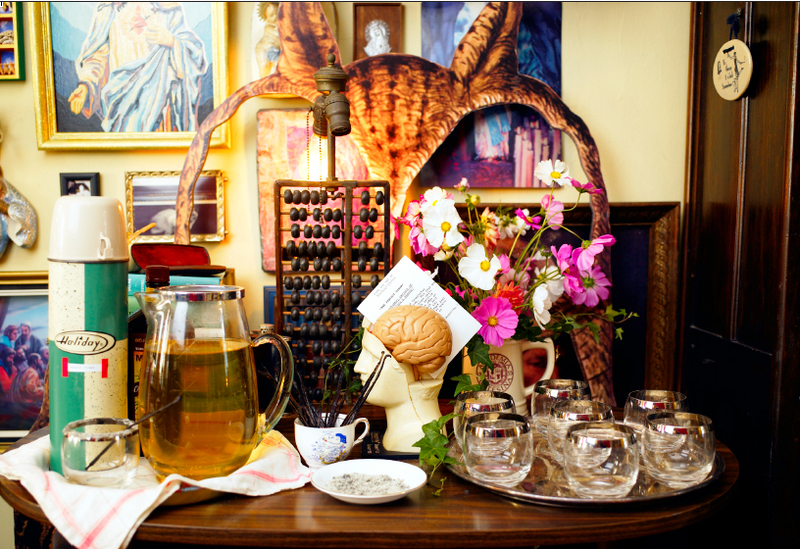 For the entertaining section of "The Find," Michael and his friends created a memorable indoor tailgate party in his Carroll Gardens, Brooklyn, apartment, incorporating many of their unique vintage wares. 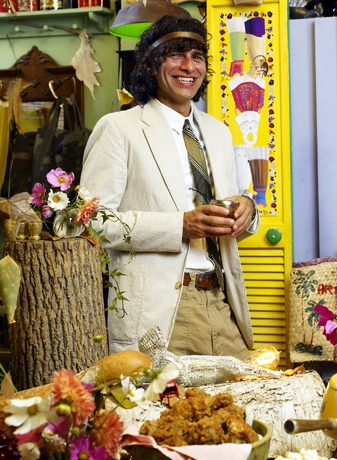 The images from the party are some of my favorite in the book, and our friendship has grown over the years along with Michael’s cache of his own thrifty finds. His apartment is so full of treasures that he has chosen my Etsy shop to sell off a selection of relics that made their way into the pages of "The Find." Over the next few days and weeks, I’ll share stories and pictures of these objects right here at The Elegant Thrifter, but until then, click here to visit my Etsy shop to enjoy - and even purchase - the offerings in "TheLiving Estate of Master Michael Quinn." 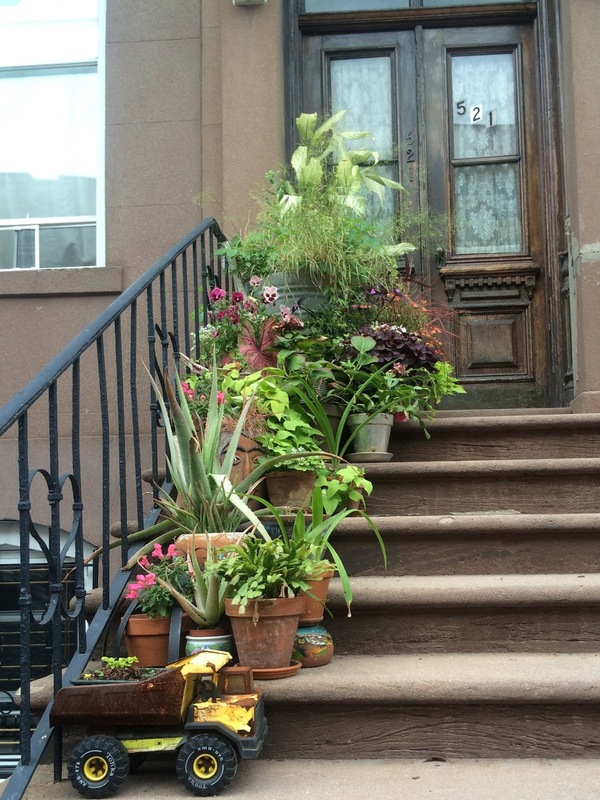 I'm always cheered every year to see Michael Quinn's planted creations tiered on the steps of his Carroll Gardens, Brooklyn stoop. The selection of plants is appealing, but the vessels that hold them deserve extra attention, exceptional for their variety and scale. Note some surprises: a jungle faced container hidden behind the gigantic leaves of an aloe plant and a Tonka Toys dump truck that's hauling a load of sprouting dirt. Chip Walker is one of my oldest friends. I won't say how long that has been, but let's just say he knew me when I had lots of hair on my head. Last summer I did a quick tour of his fabulous Chelsea loft and am now sharing the experience with you. By New York standards, the apartment Chip has lived in for four years is huge, measuring about 1,800 square feet. Plus, it has a luxury very few older buildings allow: a laundry! After moving back to New York City from a short stint in Chicago, this Birmingham, Ala., native who is a prominent brand consultant and ad executive, found himself living in a boring, box-of-a rental on Manhattan's Upper West Side. 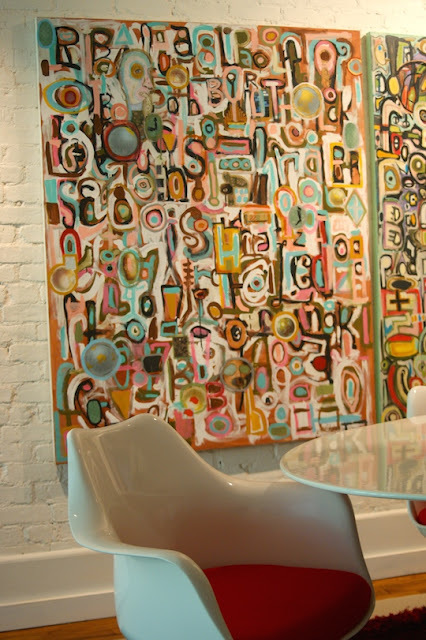 The experience set in motion an apartment search for the exact opposite: a home with expansive walls to show his growing art collection, an open living space that makes for easy entertaining and adequate room so that visitors have privacy and are out of the way. Chip found all that and more in this airy loft co-op. With a bit of help from an interior decorator friend, he transformed the space into a crisp and bright, 1960s-inspired dream pad filled with quirky art by his high school friend Christopher Lawson that easily mingles with eBay and thrift finds and Chinese antiques acquired on his world travels. Chip describes his style as, "clean, sleek retro meets kooky modern 1960s," he says. "The 1960s are my favorite furniture decade." His living room is up against the major source of light for the entire apartment, which was a challenge. "Since it’s basically a long box, the only light that comes in is at the front in the living area and in the back, the bedroom. That’s one reason painting the brick wall white (at the right) was a good idea; it brightened the space," he says. "But as far as sectioning the apartment off into other rooms in the future if I wanted to, even though it’s quite large, my options are very limited." To accent his eBay finds and paintings by Christopher Lawton, Chip turned to inexpensive resources like West Elm. His mid-century Eero Saarinen-inspired dining table and chairs also came from eBay, which he highly recommends as a source when decorating. "You can find great things not just in auctions, but also in storefronts that sell modern and mid-century furniture," he says. "I found so many resources with excellent reproductions at a fraction of the price. "I’m not really a DIY kind of person, and that’s why I had a little help from my decorator friend and hired different people to do things," Chip says. "But I am proud of the fact that by myself, I hung the West Elm chandelier (pictured here) over my dining room table." Originally, what is now a guest room/study was a clunky square with a large walk-in closet that Chip did not need. 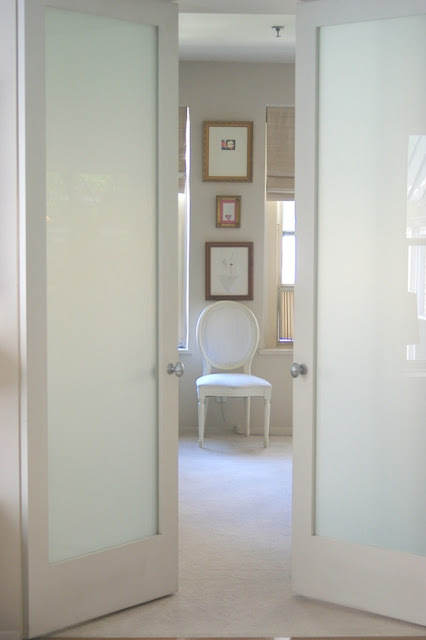 He removed the closet and installed discrete, translucent sliding doors at an angle to provide privacy for guests and retain additional light for the entire space. The table is yet another eBay find, and the Oriental rug was found on the street, as Chip stresses, "pre-bed bug craze." 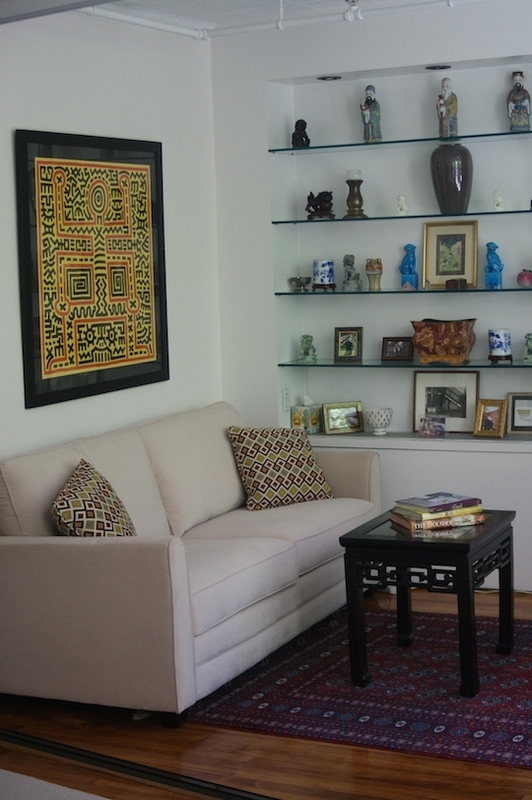 The art above the sofa was from a friend who acquired it during an office renovation. 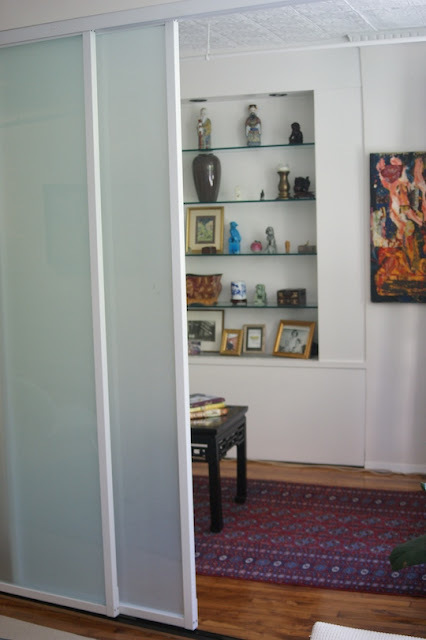 Here, the translucent sliding doors from The Sliding Door Company are closed, giving privacy to the extra room and revealing another painting by Christopher Lawton. The Arne Jacobsen-inspired chair is yet another eBay acquisition. 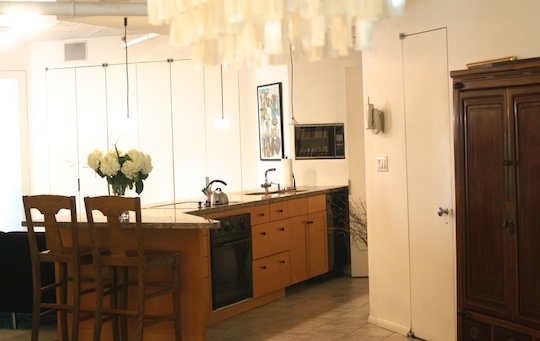 The modern kitchen is as it was when Chip purchased the apartment. While he has plans to update it, he says he enjoys its functionality, its generous storage and its easy-to-clean cook top and marble countertops. While the red pipe next to the bookshelves in the entertainment area appears to be a decorative element, it’s not. The color was dictated to comply with fire code. The bookshelves came from CB2. The Marshall Field sectional, which Chip had in his Chicago high-rise apartment, fits cozily in the area adjacent to the kitchen, making it a favorite lounging spot for guests. This retro shag rug came from Housing Works. The French doors led to an expansive bedroom that Chip calls his greatest embarrassment, even though to me, it's hard to see why, since it is light and airy, with tons of built-ins and a walk-in closet. "I just haven’t gotten around to doing anything (in the bedroom), he says. "It took me two years to decorate in the first place. In fact for almost a year, I had almost no furniture when a neighbor visited me and asked, 'When are you going to move in?'" 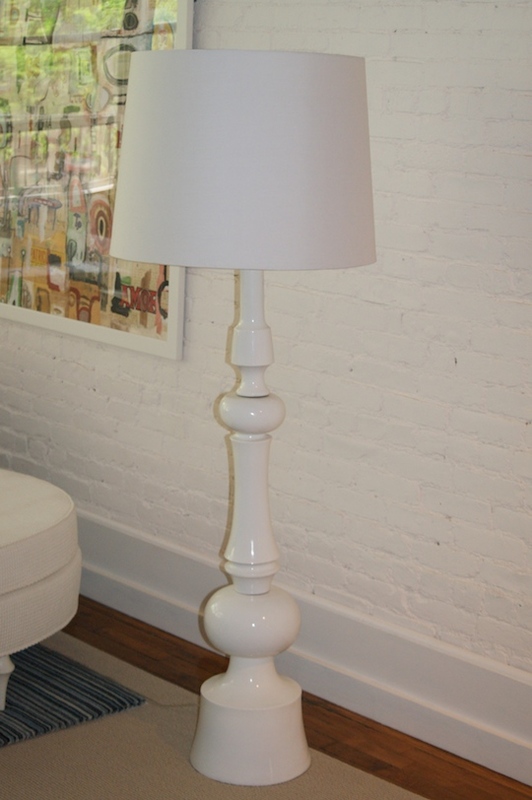 The chair, pictured here, was found on a street in Chelsea. Another of Christopher Lawton's pieces hangs above Chip's bed.